A darling little bunny basket to fill with Easter treats! 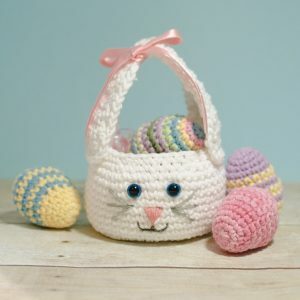 This Easter bunny basket crochet pattern is quick and simple to work up and features long bunny ears that double as a handle. Enjoy adding your own embellishments and personalizing your bunny’s face. Pair it with some crocheted Easter eggs for a pretty holiday display! You can find my free Easter egg pattern here. Finished basket with handle measures approx. 7 in. tall. The basket is worked in a continuous spiral; do not join at the end of each round. Use a stitch marker to mark the first stitch in each round. With white yarn, make a magic ring (as an alternative to the magic ring, you can ch 4 and join with a slip stitch in furthest chain from hook to form a ring). Round 1: Ch 1, work 6 sc in ring — 6 sts. Round 3: *Work 2 sc in next st, 1 sc in next st, repeat from * around — 18 sts. Round 4: *Work 2 sc in next st, 1 sc in each of the next 2 sts, repeat from * around — 24 sts. Round 5: *Work 2 sc in next st, 1 sc in each of the next 3 sts, repeat from * around — 30 sts. Round 6: *Work 2 sc in next st, 1 sc in each of the next 4 sts, repeat from * around — 36 sts. Round 7: *Work 2 sc in next st, 1 sc in each of the next 5 sts, repeat from * around — 42 sts. Round 8: *Work 2 sc in next st, 1 sc in each of the next 6 sts, repeat from * around — 48 sts. Rounds 9 through 17: Work 1 sc in each st around — 48 sts. Round 18: *Sc2tog, 1 sc in each of the next 6 sts, repeat from * around — 42 sts. Round 19: *Sc2tog, 1 sc in each of the next 5 sts, repeat from * around — 36 sts. Slip stitch in next st and fasten off. Weave in ends. Place safety eyes between Rounds 15 and 16 about 5 sts apart. Using lightweight colored yarn embroider nose, mouth, and whispers as shown above. With white yarn, ch 10. Row 1: Work 1 sc in 2nd st from hook and each ch across, turn — 9 sts. Rows 2 and 3: Ch 1, work 1 sc in each st across, turn — 9 sts. Row 4: Ch 1, sc2tog, work 1 sc in each of the next 5 sts, sc2tog, turn — 7 sts. Rows 5 through 7: Ch 1, work 1 sc in each st across, turn — 7 sts. Row 8: Ch 1, sc2tog, work 1 sc in each of the next 3 sts, sc2tog, turn — 5 sts. Rows 9 through 11: Ch 1, work 1 sc in each st across, turn — 5 sts. Row 12: Ch 1, sc2tog, work 1 sc in next st, sc2tog, turn — 3 sts. Rows 13 through 15: Ch 1, work 1 sc in each st across, turn — 3 sts. Row 16: Ch 1, sc3tog, do not turn — 1 sts. Work a sc edging around each ear. Fasten off. Using a yarn needle and length of white yarn, sew ears to top of each side of basket. Stitch tops of ears together to form a handle. Weave in ends. Tie a colored bow around ear as shown if desired. 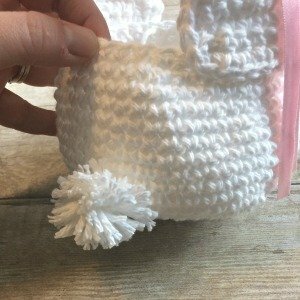 Using white yarn, make a pom pom of about 2 in. in diameter. Sew pom pom to the bottom center of the back of your basket. If desired, you can place a circular piece of cork or cardboard to add extra support to the bottom. Now just fill with treats and enjoy! 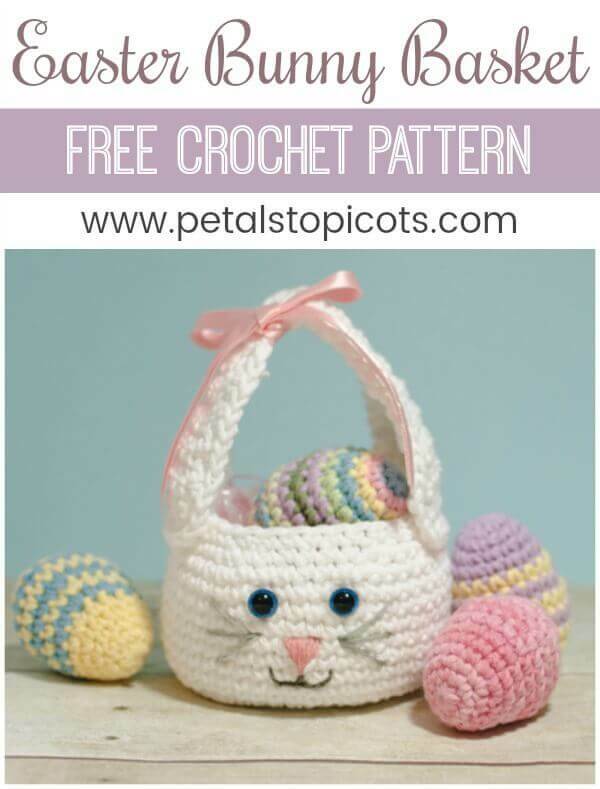 Click here for more Free Easter Crochet Patterns. I made this for my granddaughter & love it, thank you for sharing this pattern. However, my ears droop. Any suggestions? Hi Becky 🙂 You might be able to use some pipe cleaners to support the ears. 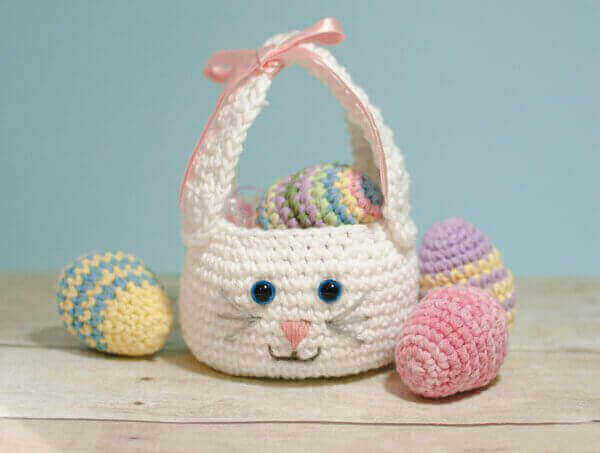 Adorable basket, I love how it turned out, but my ears are droopy. How can I keep them up? I made this yesterday, your pattern was easy to follow and I am happy with the basket, thanks for sharing. Yay, that makes me so happy to hear! what happens with the fiberfill? You are correct, it isn’t needed. I have deleted it from the supply list. I made it in one day and I mailed it to friends of mine in London. They have a 4 year old daughter and I hope she likes it. This is adorable! Thank you for the lovely free pattern!